Now I feel a little bad for making fun of my History teacher for pronouncing Chinese words incorrectly... GAH, that would be embarrassing. I'm sure you have a delightful accent! I take it you speak from experience. Yes, and with a passable accent! I have had this happen to me, too. I was in Australia and ran into a couple of guys from Austria. They didn't think I was from America and bashed Americans similar to the cartoon. When I told them I was American, they turned beet red. 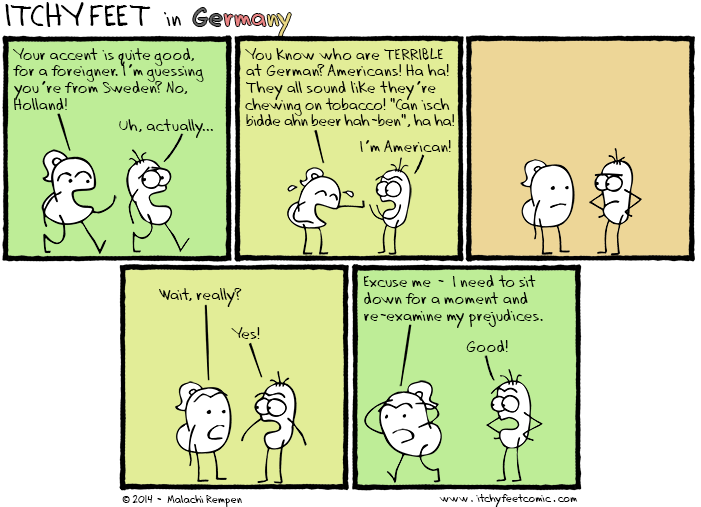 I recorded myself reading aloud in German and I sounded a great deal like the stereotypical American in the cartoon. So now my elderly German friend is helping me with pronunciation :). Well, bashing Americans is pretty fashionable. :-/ It still amazes me what people say when they don't realize (or forget) that you are one! I think they do it without really realizing it, honestly, it's just kind of become fashion/habit. Prejudice can sometimes be bad. But I'll say learning isn't so hard. You can learn how to speak german through skype at websites like http://preply.com/en/german-by-skype and be actually fluent.